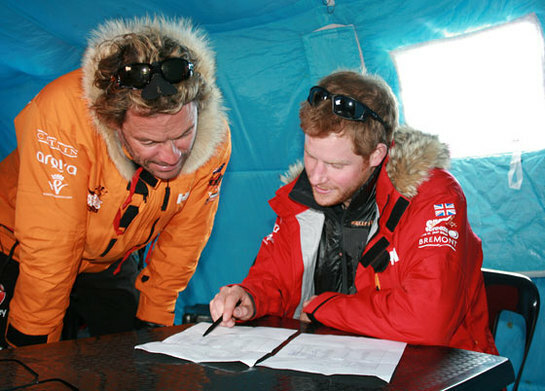 Prince Harry and his fellow Walking With The Wounded expedition members – including actor Dominic West – are at the base camp Novo in Antarctica. The South Pole Allied Challenge teams had hoped to take part in some skiing training to help acclimatise, but a snow storm and very high winds left them largely confined to their basic accommodation blocks at Novo. Their departure date to the second base camp at 87 degrees south is also likely to be moved to Tuesday at the earliest. The Walking With The Wounded South Pole Allied Challenge 2013, of which Prince Harry is patron, will see the participants race across three degrees to the South Pole. The teams of service personnel, all of whom have physical or cognitive injuries, will represent and raise funds for military charities from the constituent nations: Soldier On (Canada); Soldier On (Australia); Soldiers to Summits (United States); and Walking With The Wounded (United Kingdom). They will race 335km across the Antarctic Plateau. The distance will be divided into managed stages and checkpoints and each team will have an experienced polar guide and nominated mentor. Due to the hostile conditions and the nature of the injuries involved, the expedition teams will be followed by a support team, who will be on hand in case of emergencies. They hope to reach the geographic South Pole by December 16.